Falls Lake State Recreation Area is a North Carolina state park in Durham and Wake Counties, North Carolina in the United States. 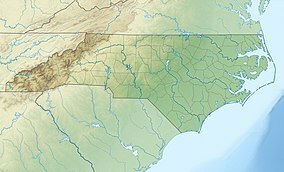 Near Wake Forest, North Carolina, it covers 5,035 acres (20.38 km2) along the shores of 12,410-acre (50.2 km2) Falls Lake. Prior to 1978, flooding of the Neuse River caused extensive damage to public and private properties including roadways, railroads, industrial sites and farmlands. The Falls Lake Project was developed by the US Army Corps of Engineers to control damaging floods. Construction of the dam began in 1978 and was completed in 1981. In addition to recreation opportunities, Falls Lake now provides flood and water-quality control, water supply, and fish and wildlife conservation. In 1992, the NC Division of Parks and Recreation took control of the James Mangum House as part of Beaverdam Recreation Area. Rock Cliff Farm is owned by the Federal government, and part of a large acreage managed by the State of North Carolina as the Falls Lake State Recreation Area. It was listed on the National Register of Historic Places in 2007. Falls Lake hiking trails on the south side are part of the Mountains-to-Sea Trail which stretches from Clingmans Dome in the Great Smoky Mountains to Jockey's Ridge State Park on the Outer Banks of North Carolina. Camping along the Falls Lake portion of the trail is only available at Shinleaf Recreation Area in Wake County and Rolling View Recreation Area in Durham County. Trails are easy to moderate on some steep ridges. The Beaver Dam bike trails at Falls Lake are easy to intermediate and have trails for everyone. Trail heads are accessible from inside park entrance at Beaverdam Recreation Area only. Launching kayaks and canoes leads to endless possibilities with the many miles of water to explore in Falls Lake. Visit camp sites, swimming areas, local marinas and see wildlife such as catfish, turtles,deer and osprey. Use caution on popular holidays such as Memorial Day, the lake will be crowded with water skiers and jet skis. Beaver Dam lake boat launch, just north of the Hwy 50 boat launch does not allow motor boats and is safer for the beginner paddler. It also has a beach with swimming area. Falls Lake is accessible by kayak from Beaver Dam Lake. Fees apply to both ramps in the summer. Falls Lake is one of the settings in the spy thriller novel Crisis Four by Andy McNab. ^ a b "Size of the North Carolina State Parks System". North Carolina Division of Parks and Recreation. January 1, 2015. Archived from the original (XLS) on 2015-10-04. Retrieved October 3, 2015. ^ Davyd Foard Hood (July 2006). "Rock Cliff Farm" (pdf). National Register of Historic Places - Nomination and Inventory. North Carolina State Historic Preservation Office. Retrieved 2015-06-01. ^ McNab, Andy (2000). Crisis Four. New York: Ballantine Books. ISBN 0345428072. This page was last edited on 12 November 2018, at 05:04 (UTC).